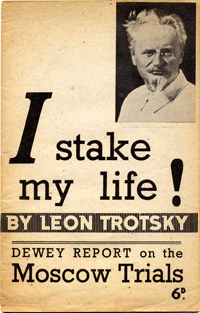 Trotsky’s address to the N.Y. Hippodrome Meeting was delivered by telephone from Mexico City for the opening event of the Dewey Commission on the Moscow Trials on February 9th, 1937. Transcription from a pamphlet issued in Great Britain by the Workers’ International League, presumably in 1942. Thanks to marxist.com for permission to copy this online edition. My first word is one of apology for my impossible English. My second word is one of thanks to the Committee which has made it possible for me to address your meeting. The theme of my address is the Moscow trial. I do not intend for an instant to overstep the limits of this theme, which even in itself is much too vast. I will appeal not to the passions, not to your nerves, but to reason. I do not doubt that reason will be found on the side of truth. The Zinoviev-Kamenev trial has provoked in public opinion terror, agitation, indignation, distrust, or at least, perplexity. The trial of Piatakov-Radek has once more enhanced these sentiments. Such is the incontestable fact. A doubt of justice signifies, in this case, a suspicion of frame-up. Can one find a more humiliating suspicion against a government which appears under the banner of socialism? Where do the interests of the soviet government itself lie? In dispelling these suspicions. What is the duty of the true friends of the Soviet Union? To say firmly to the soviet government: it is necessary at all costs to dispel the distrust of the Western world for soviet justice. To answer to this demand: “We have our justice the rest does not concern us much,” is to occupy oneself, not with the socialist enlightment of the masses, but with the policies of inflated prestige, in the style of Hitler or Mussolini. Even the “Friends of the USSR,” who are convinced in their own hearts of the justice of the Moscow trials (and how many are there? What a pity that one cannot take a census of consciences! ), even these unshakable friends of the bureaucracy are in duty-bound to demand with us the creation of an authorised commission of inquiry. The Moscow authorities must present to such a commission all the necessary testimonies. There can evidently be no lack of them since it was on the basis of those given that 49 persons were shot in the “Kirov” trials, without counting the 150 who were shot without trial. Let us recall that by way of guarantees for the justice of the Moscow verdicts before world public opinion two lawyers present themselves: Pritt from London and Rosenmark from Paris, not to mention the American journalist Duranty. But who gives guarantee for these guarantees? The two lawyers, Pritt and Rosenmark, acknowledge gratefully that the soviet government placed at their disposal all the necessary explanations. Let us add that the “King’s Counsellor” Pritt was invited to Moscow at a fortunate time, since the date of the trial was carefully concealed from the entire world until the last moment. The soviet government did not thus count on humiliating the dignity of its justice by having recourse behind the scenes to the assistance of foreign lawyers and journalists. But when the Socialist and Trade Union Internationals demanded the opportunity to send their lawyers to Moscow, they were treated – no more and no less – as defenders of assassins and of the Gestapo! You know of course, that I am not a partisan of the Second International or of the Trade Union International. But is it not clear that their moral authority is incomparably above the authority of lawyers with supple spines? Have we not the right to say: the Moscow government forgets its “prestige” before authorities and experts, whose approbation is assured to them in advance; it is cheerfully willing to make the "King’s Counsel” Pritt a counsellor of the GPU. But, on the other hand, it has up to now brutally rejected every examination which would carry with it guarantees of objectivity and impartiality. Such is the incontestable and deadly fact! Perhaps, however, this conclusion is inaccurate? There is nothing easier than to refute it: let the Moscow government present to an international commission of inquiry serious, precise and concrete explanations regarding all the obscure spots of the Kirov trials. And apart from these obscure spots there is – alas! – nothing. That is precisely why Moscow resorts to all kinds of measures to force me, the principal accused, to keep my silence. Under Moscow’s terrible economic pressure the Norwegian government placed me under lock-and-key. What good fortune that the magnanimous hospitality of Mexico permitted me and my wife to meet the new trial, not under imprisonment, but in freedom! But all the wheels to force me once more into silence have again been set into motion. Why does Moscow so fear the voice of a single man? Only because I know the truth, the whole truth. Only because I have nothing to hide. Only because I am ready to appear before a public and impartial commission of inquiry with documents facts and testimonies in my hands, and to disclose the truth to the very end. I declare: if this commission decides that I am guilty in the slightest degree of the crimes which Stalin imputes to me, I pledge in advance to place myself voluntarily in the hands of the executioners of the GPU. That, I hope, is clear. Have you all heard? I make this declaration before the entire world. I ask the press to publish my words in the farthest corners of our planet. But if the commission establishes – do you hear me? that the Moscow trials are a conscious and premeditated frame-up, constructed with the bones and nerves of human beings, I will not ask my accusers to place themselves voluntarily before a firing-squad. No, eternal disgrace in the memory of human generations will be sufficient for them. Do the accusers of the Kremlin hear me? I throw my defiance in their faces. And I await their reply! Through this declaration I reply in passing to the frequent objections of superficial sceptics: “Why must we believe Trotsky and not Stalin?” It is absurd to busy one’s self with psychological divinations. It is not a question of personal confidence. It is a question of verification! I propose a verification! I demand the verification! Listeners and friends! Today you expect from me neither a refutation of the “proofs,” which do not exist in this affair, nor a detailed analysis of the “confessions,” those unnatural, artificial, inhuman monologues which carry in themselves their own refutation. I would need more time than the prosecutor for a concrete analysis of the trials, because it is more difficult to disentangle than to entangle. This work I will accomplish in the press and before the future commission. My task today is to unmask the fundamental, original viciousness of the Moscow trials, to show the motive forces of the frame-up, its true political aims, the psychology of its participants and of its victims. The trial of Zinoviev-Kamenev was concentrated upon “terrorism.” The trial of Piatakov-Radek placed in the centre of the stage, no longer terror, but the alliance of the Trotskyists with Germany and Japan for the preparation of war, the dismemberment of the USSR, the sabotage of industry and the extermination of workers. How to explain this crying discrepancy? For, after the execution of the 16 we were told that the depositions of Zinoviev, Kamenev and the others were voluntary, sincere, and corresponded to the facts. Moreover, Zinoviev and Kamenev demanded the death penalty for themselves! Why then did they not say a word about the most important thing: the alliance of the Trotskyists with Germany and Japan and the plot to dismember the USSR? Could they have forgotten such “details” of the plot? Could they themselves, the leaders of the so-called centre, not have known what was known by the accused in the last trial, people of a secondary category? The enigma is easily explained: the new amalgam was constructed after the execution of the 16 during the course of the last five months, as an answer to unfavourable echoes in the world press. The most feeble part of the trial of the 16 is the accusation against old Bolsheviks of an alliance with the secret police of Hitler, the Gestapo. Neither Zinoviev, nor Kamenev, nor Smirnov, nor in general any one of the accused with political names, confessed to this liaison; they stopped short before this extreme self-abasement! It follows that I, through obscure, unknown intermediaries, such as Olberg, Berman, Fritz David and others, had entered into an alliance with the Gestapo for such grand purposes as the obtaining of a Honduran passport for Olberg. The whole thing was too foolish. No one wanted to believe it. The whole trial was discredited. It was necessary to correct the gross error of the stage-managers at all costs. It was necessary to fill up the hole. Yagoda was replaced by Yezhov. A new trial was placed on the order of the day. Stalin decided to answer his critics in this way: “You don’t believe that Trotsky is capable of entering into an alliance with the Gestapo for the sake of an Olberg and a passport from Honduras. Very well, I will show you that the purpose of his alliance with Hitler was to provoke war and partition out the world." However, for this second, more grandiose production, Stalin lacked the principal actors: he had shot them. In the principal roles of the principal presentation he could place only secondary actors! It is not superfluous to note that Stalin attached much value to Piatakov and Radek as collaborators. But he had no other people with well-known names, who, if only because of their distant pasts, could pass as “Trotskyists.” That is why fate descended sternly upon Radek and Piatakov. The version about my meetings with the rotten trash of the Gestapo through unknown occasional intermediaries was dropped. The matter was suddenly raised to the heights of the world stage! It was no longer a question of a Honduran passport, but of the parcelling out of the USSR and even the defeat of the United States of America. With the aid of a gigantic elevator the plot ascends during a period of five months from the dirty police dregs to the heights on which are decided the destinies of nations. Zinoviev, Kamenev, Smirnov, Mrachkovsky, went to their graves without knowing of these grandiose schemes, alliances, and perspectives. Such is the fundamental falsehood of the last amalgam! Radek and Piatakov themselves regarded Zinoviev and Kamenev as their superiors, and in this self-appreciation they were not mistaken. But more than that. At the time of the trial of the 16, the prosecutor named Smirnov as the “leader of the Trotskyists in the USSR.” The accused Mrachkovsky, as a proof of his closeness to me, declared that I was accessible only through his intermediation, and the prosecutor in his turn emphasised this fact. How then was it possible that not only Zinoviev and Kamenev, but Smirnov, the “leader of the Trotskyists in the USSR,” and Mrachkovsky as well, knew nothing of the plans about which I had instructed Radek, openly branded by me as a traitor? Such is the primary falsehood of the last trial. It appears by itself in broad daylight. We know its source. We see the strings off-stage. We see the brutal hand which pulls them. Radek and Piatakov confessed to frightful crimes. But their crimes, from the point of view of the accused and not of the accusers, do not make sense. With the aid of terror, sabotage and alliance with the imperialists, they would have liked to re-establish capitalism in the Soviet Union. Why? Throughout their entire lives they struggled against capitalism. Perhaps they were guided by personal motives: the lust for power? the thirst for gain? Under any other regime Piatakov and Radek could not hope to occupy higher positions than those which they occupied before their arrest. Perhaps they were so stupidly sacrificing themselves out of friendship for me? An absurd hypothesis! By their actions, speeches, and articles during the last eight years, Radek and Piatakov demonstrated that they were my bitter enemies. Terror? But is it possible that the oppositionists, after all the revolutionary experience in Russia, could not have foreseen that this would only serve as a pretext for the extermination of the best fighters? No, they knew that, they foresaw it, they stated it hundreds of times. No, terror was not necessary for us. On the other hand it was absolutely necessary for the ruling clique. On the 4th of March 1929, eight years ago, I wrote: “Only one thing is left for Stalin: to attempt to draw a line of blood between the official party and the opposition. He absolutely must connect the opposition with attempts at assassination, the preparation of armed insurrection, etc.” Remember: Bonapartism has never existed in history without police fabrications of plots! At the heart of the Moscow trials is an absurdity. According to the official version, the Trotskyists had been organising the most monstrous plot since 1931. However, all of them, as if by command, spoke and wrote in one way but acted in another. In spite of the hundreds of persons implicated in the plot, over a period of five years, not a trace of it was revealed: no splits, no denunciations, and no confiscated letters, until the hour of the general confessions arrived! Then a new miracle came to pass. People who had organised assassinations, prepared war, divided the Soviet Union, these hardened criminals suddenly confessed in August, 1936, not under the pressure of proofs – no, because there were no proofs – but for certain mysterious reasons, which hypocritical psychologists declare are peculiar attributes of the “Russian soul.” Just think: yesterday they carried out railroad wrecking and poisoning of workers – by unseen order of Trotsky. Today they are Trotsky’s accusers and heap upon him their pseudo-crimes. Yesterday they dreamed only of killing Stalin. Today they all sing hymns of praise to him. What is it: a mad-house? No, the Messieurs Duranty tell us, it is not a mad-house, but the, “Russian soul.” You lie gentlemen, about the Russian soul. You lie about the human soul in general. The miracle consists not only in the simultaneity and the universality of the confessions. The miracle, above all, is that, according to the general confessions, the conspirators did something which was fatal precisely to their own political interests, but extremely useful to the leading clique. Once more the conspirators before the tribunal said just what the most servile agents of Stalin would have said. Normal people, following the dictates of their own will, would never have been able to conduct themselves as Zinoviev, Kamenev, Radek, Piatakov and the others did. Devotion to their ideas, political dignity, and the simple instinct of self-preservation would force them to struggle for themselves, for their personalities, for their interests, for their lives. The only reasonable and fitting question is this: Who led these people into a state in which all Human reflexes are destroyed, and how did he do it? There is a very simple principle in jurisprudence, which holds the key to many secrets: is fecit cui prodest; he who benefits by it is the guilty one. The entire conduct of the accused has been dictated from beginning to end, not by their own ideas and interests, but by the interests of the ruling clique. And the pseudo-plot, and the confessions, the theatrical judgment and the entirely real executions, all were arranged by one and the same hand. Whose? Cui prodest? Who benefits? The hand of Stalin! The rest is deceit, falsehood, and idle babbling about the “Russian soul"! In the trials there did not figure fighters, nor conspirators, but puppets in the hands of the GPU. They played assigned roles. The aim of the disgraceful performance: to eliminate the whole opposition, to poison the very source of critical thought, definitely to entrench the totalitarian regime of Stalin. We repeat: The accusation is a premeditated frame-up. This frame-up must inevitably appear in each of the defendants’ confessions, if they are examined alongside the facts. The prosecutor Vyshinsky knows this very well. That is why he did not address a single concrete question to the accused, which would have embarrassed them considerably. The names, documents, dates, places, means of transportation, circumstances of the meetings – around these decisive facts Vyshinsky has placed a cloak of shame, or to be more exact, a shameless cloak. Vyshinsky dealt with the accused, not in the language of the jurist, but in the conventional language of the past-master of frame-up, in the jargon of the thief. The insinuating character of Vyshinsky’s questions – along with the complete absence of material proofs – this represents the second crushing evidence against Stalin. But I do not intend to limit myself to these negative proofs. Oh, no! Vyshinsky has not demonstrated and cannot demonstrate that the subjective confessions were genuine, that is to say, in harmony with the objective facts. I undertake a much more difficult task: to demonstrate that each one of the confessions is false, that is, contradicts reality. Of what do my proofs consist? I will give you a couple of examples. I should need at least an hour to lay before you the two principal episodes: the pseudo-trip of the accused Holtzman to see me in Copenhagen, to receive terrorist instructions, and the pseudo-voyage of the accused Piatakov to see me in Oslo, to get instructions about the dismemberment of the Soviet Union. I have at my disposal a complete arsenal of proofs that Holtzman did not come to see me in Copenhagen, and that Piatakov did not come to see me in Oslo. Now I mention only the simplest proofs, all that the limitations of time permit. Unlike the other defendants, Holtzman indicated the date: November 23–25, 1932 (the secret is simple: through the newspapers it was known when I arrived in Copenhagen), and the following concrete details: Holtzman came to visit me through my son, Leon Sedov, whom he, Holtzman, had met in the Hotel Bristol. Concerning the Hotel Bristol, Holtzman had a previous agreement with Sedov in Berlin. When he came to Copenhagen, Holtzman actually met Sedov in the lobby of this hotel. From there they both came to see me. At the time of Holtzman’s rendezvous with me, Sedov, according to Holtzman’s words, frequently walked in and out of the room. What vivid details! We sigh in relief: at last we have, not just confused confessions, but also something which looks like a fact. The sad part of it, however, dear listeners, is that my son was not in Copenhagen, neither in November 1932 nor at any other time in his life. I beg you to keep this well in mind! In November 1932, my son was in Berlin, that is, in Germany and not in Denmark, and made vain efforts to leave in order to meet me and his mother in Copenhagen: don’t forget that the Weimar democracy was already gasping out its last breath, and the Berlin police were becoming stricter and stricter. All the circumstances of my son’s procedure regarding his departure are established by precise evidence. Our daily telephonic communications with my son from Copenhagen to Berlin can be established by the telephone office in Copenhagen. Dozens of witnesses, who at that time surrounded my wife and myself in Copenhagen, knew that we awaited our son impatiently, but in vain. At the same time, all of my son’s friends in Berlin know that he attempted in vain to obtain a visa. Thanks precisely to these incessant efforts and obstacles, the fact that the meeting never materialised remains in the memories of dozens of people. They all live abroad and have already given their written depositions. Does that suffice? I should hope so! Pritt and Rosenmark, perhaps, say “No”? Because they are indulgent only with the GPU! Good: I will meet them half way. I have still more immediate, still more direct, and still more indisputable proofs. Actually, our meeting with our son took place after we left Denmark, in France, en route to Turkey. That meeting was made possible only thanks to the personal intervention of the French Premier, at that time, M. Herriot. In the French Ministry of Foreign Affairs my wife’s telegram to Herriot, dated the first of December, has been preserved, as well as Herriot’s telegraphic instruction to the French consulate in Berlin, on December 3rd, to give my son a visa immediately. For a time I feared that the agents of the GPU in Paris would seize those documents. Fortunately they have not succeeded. The two telegrams were luckily found some weeks ago in the Ministry of Foreign Affairs. Do you understand me clearly? I now have copies of both telegrams at hand. I do not cite their texts, numbers and dates in order not to lose any time: I will give them to the press tomorrow. Mr. E. Herriot, President of the Council, Paris. Mme. Trotsky who is returning home from Denmark would be glad if she could meet her son, Leon Sedov, at present studying in Berlin, while passing through French territory. I thus authorize you to vise the passport of Mr. Sedov for a five day stay in France with the further assurance that he be allowed to return to Germany at the expiration of this sojourn. On my son’s passport there is a visa granted by the French Consulate on December 3rd. On the morning of the fourth my son left Berlin. On his passport there are seals received at the frontier on the same day. The passport has been preserved in its entirety. Citizens of New York, do you hear my voice from Mexico City? I want you to hear every one of my words, despite my frightful English! Our meeting with our son took place in Paris, in the Gare du Nord, in a second-class train, which took us from Dunkerque, in the presence of dozens of friends who accompanied us and received us. I hope that is enough! Neither the GPU nor Pritt can ignore it. They are gripped in an iron vice. Holtzman could not see my son in Copenhagen because my son was in Berlin. My son could not have gone in and out during the course of the meeting. Who then will believe the fact of the meeting itself? Who will place any credence in the whole confession of Holtzman? But that isn’t all. According to Holtzman’s words, his meeting with my son took place, as you have already heard, in the hall of the Hotel Bristol. Magnificent ... But it so happens that the Hotel Bristol in Copenhagen was razed to its very foundations in 1917! In 1932 this hotel existed only as a fond memory. The hotel was rebuilt only in 1936, precisely during the days when Holtzman was making his unfortunate declarations. The obliging Pritt presents us with the hypothesis of a probable “slip of the pen”: the Russian stenographer, you see, must have heard the word Bristol incorrectly, and moreover, none of the reporting journalists and editors corrected the error: Good! But how about my son? Also a stenographer’s slip of the pen? There Pritt, following Vyshinsky, maintains an eloquent silence. In reality the GPU, through its agents in Berlin, knew of my son’s efforts and assumed that he met me in Copenhagen. There is the source of the “slip of the pen”! Holtzman apparently knew the Hotel Bristol through memories of his emigration long ago, and that is why he named it. From that flows the second “slip of the pen”! Two slips combine to make a catastrophe: of Holtzman’s confessions there remains only a cloud of coal-dust, as of the Hotel Bristol at the moment of its destruction. And meanwhile – don’t forget this! – this is the most important confession in the trial of the sixteen: of all the old revolutionaries, only Holtzman had met me and received terrorist instructions! Let us pass to the second episode. Piatakov came to see me by airplane from Berlin to Oslo in the middle of December 1935. Of the thirteen precise questions which I addressed to the Moscow tribunal while Piatakov was yet alive, not a single one was answered. Each one of these questions destroys Piatakov’s mythical voyage. Meanwhile my Norwegian host, Konrad Knudsen, a parliamentary deputy, and my former secretary, Erwin Wolff, have already stated in the press that I had no Russian visitor in December 1935, and that I made no journeys without them. Don’t these depositions satisfy you? Here is another one: the authorities of the Oslo aerodrome have officially established, on the basis of their records, that during the course of December 1935, not a single foreign airplane landed at their airport! Perhaps a slip of the pen has also crept into the records of the aerodrome? Master Pritt, enough of your slips of the pen, kindly invent something more intelligent! But your imagination will avail you nothing here: I have at my disposal dozens of direct and indirect testimonies which expose the depositions of the unfortunate Piatakov, who was forced by the GPU to fly to see me in an imaginary airplane, just as the Holy Inquisition forced witches to go to their rendezvous with the devil on a broomstick. The technique has changed, but the essence is the same. In the Hippodrome there are undoubtedly competent jurists. I beg them to direct their attention to the fact that neither Holtzman nor Piatakov gave the slightest indication of my address, that is to say, of the time and the meeting place. Neither one nor the other told of the precise passport or the precise name under which he travelled abroad. The prosecutor did not even question them about their passports. The reason is clear: their names would not be found in the lists of travellers abroad. Piatakov could not have avoided sleeping over in Norway, because the December days are very short. However, he did not name any hotel. The prosecutor did not even question him about the hotel. Why? Because the ghost of the Hotel Bristol hovers over Vyshinsky’s head! The prosecutor is not a prosecutor, but Piatakov’s inquisitor and inspirer, just as Piatakov is only the unfortunate victim of the GPU. I could now present an enormous amount of testimony and documents which would demolish at their very foundations the confessions of a whole series of defendants: Smirnov, Mrachkovsky, Dreitzer, Radek, Vladimir Romm, Olberg, in short, of all those who tried in the slightest degree to give facts, circumstances of time and place. Such a job, however, can be done successfully only before a Commission of Inquiry, with the participation of jurists having the necessary time for detailed examination of documents and for hearing the depositions of witnesses. But already what has been said by me permits, I hope, a forecast of the future development of the investigation. On the one hand, an accusation which is fantastic to its very core: the entire old generation of Bolsheviks is accused of an abominable treason, devoid of sense or purpose. To establish this accusation the prosecutor does not have at his command any material proofs, in spite of the thousands and thousands of arrests and searchings. The complete absence of evidence is the most terrible evidence against Stalin! The executions are based exclusively on forced confessions. And when facts are mentioned in these confessions, they crumble to dust at the first contact with critical examination. The GPU is not only guilty of frame-up. It is guilty of concocting a rotten, gross, foolish frame-up. Impunity is depraving. The absence of control paralyzes criticism. The falsifiers carry out their work no matter how. They rely on the sum-total effect of confessions and ... executions. If one carefully compares the fantastic nature of the accusation in its entirety with the manifest falsehood of the factual depositions, what is left of all these monotonous confessions? The suffocating odour of the inquisitorial tribunal, and nothing more! But there is another kind of evidence which seems to me no less important. In the year of my deportation and the eight years of my emigration I wrote to close and distant friends about 2,000 letters dedicated to the most vital questions on current politics. The letters received by me and the copies of my replies exist. Thanks to their continuity, these letters reveal, above all, the profound contradictions, anachronisms and direct absurdities of the accusation, not only in so far as myself and my son are concerned, but also as regards the other accused. However, the importance of these letters extends beyond that fact. All of my theoretical and political activity during these years is reflected without a gap in these letters. The letters supplement my books and articles. The examination of my correspondence, it seems to me, is of decisive importance for the characterisation of the political and moral personality – not only of myself, but also of my correspondents. Vyshinsky has not been able to present a single letter to the tribunal. I will present to the commission or to a tribunal thousands of letters, addressed, moreover, to the people who are closest to me and from whom I had nothing to hide, particularly to my son, Leon. This correspondence alone by its internal force of conviction nips the Stalinist amalgam in the bud. The prosecutor with his subterfuges and his insults and the accused with their confessional monologues are left suspended in thin air. Such is the significance of my correspondence. Such is the content of my archives. I do not ask anybody’s confidence. I make an appeal to reason, to logic, to criticism. I present facts and documents. I demand a verification! Among you, dear listeners, there must be not a few people who freely say: “The confessions of the accused are false, that is clear; but how was Stalin able to obtain such confessions; therein lies the secret!” In reality the secret is not so profound. The inquisition, with a much more simple technique, extorted all sorts of confessions from its victims. That is why the democratic penal law renounced the methods of the Middle Ages, because they led not to the establishment of the truth, but to a simple confirmation of the accusations dictated by the inquiring judge. The GPU trials have a thoroughly inquisitorial character: that is the simple secret of the confessions! The whole political atmosphere of the Soviet Union is impregnated with the spirit of the Inquisition. Have you read Andre Gide’s little book, Return from the USSR? Gide is a friend of the Soviet Union, but not a lackey of the bureaucracy. Moreover, this artist has eyes. A little episode in Gide’s book is of incalculable aid in understanding the Moscow trials. At the end of his trip Gide wished to send a telegram to Stalin, but not having received the inquisitorial education, he referred to Stalin with the simple democratic word “you.” They refused to accept the telegram! The representatives of authority explained to Gide: “When writing to Stalin one must say, ‘leader of the workers’ or ‘chieftain of the people,’ not the simple democratic word ‘you’.” Gide tried to argue: “Isn’t Stalin above such flattery?” It was no use. They still refused to accept his telegram without the Byzantine flattery. At the very end Gide declared: “I submit in this wearisome battle, but disclaim all responsibility.” Thus a universally recognised writer and honoured guest was worn out in a few minutes and forced to sign, not the telegram which he himself wanted to send, but that which was dictated to him by petty inquisitors. Let him who has a particle of imagination picture to himself, not a well-known traveller, but an unfortunate Soviet citizen, an oppositionist, isolated and persecuted, a pariah, who is constrained to write, not telegrams of salutation to Stalin, but dozens and scores of confessions of his crimes. Perhaps in this world there are many heroes who are capable of bearing all kinds of tortures, physical or moral, which are inflicted on themselves, their wives, their children. I do not know ... My personal observations inform me that the capacities of the human nervous system are limited. Through the GPU Stalin can trap his victim in an abyss of black despair, humiliation, infamy, in such a manner that he takes upon himself the most monstrous crimes, with the prospect of imminent death or a feeble ray of hope for the future as the sole outcome. If, indeed, he does not contemplate suicide, which Tomsky preferred! Joffe earlier found the same way out, as well as two members of my military secretariat, Glazman and Boutov, Zinoviev’s secretary, Began, my daughter Zinnia, and many dozens of others. Suicide or moral prostration: there is no other choice! But do not forget that in the prisons of the GPU even suicide is often an inaccessible luxury! The Moscow trials do not dishonour the revolution, because they are the progeny of reaction. The Moscow trials do not dishonour the old generation of Bolsheviks; they only demonstrate that even Bolsheviks are made of flesh and blood, and that they do not resist endlessly when over their heads swings the pendulum of death. The Moscow trials dishonour the political regime which has conceived them: the regime of Bonapartism, without honour and without conscience! All of the executed died with curses on their lips for this regime. Let him who wishes weep bitter tears because history moves ahead so perplexingly: two steps forward, one step back. But tears are of no avail. It is necessary according to Spinoza’s advice, not to laugh, not to weep, but to understand! Who are the principal defendants? Old Bolsheviks, builders of the party, of the Soviet state, of the Red Army, of the Communist International. Who is the accuser against them? Vyshinsky, bourgeois lawyer, who called himself a Menshevik after the October revolution and joined the Bolsheviks after their definite victory. Who wrote the disgusting libels about the accused in Pravda? ... Zaslaysky, former pillar of a banking journal, whom Lenin treated in his articles only as a “rascal.” The former editor of Pravda, Bukharin, is arrested. The pillar of Pravda is now Koltzov, bourgeois feuilletonist, who remained throughout the civil war in the camp of the Whites. Sokolnikov, a participant in the October revolution and the civil war, is condemned as a traitor. Rakovsky awaits accusation. Sokolnikov and Rakovsky were ambassadors to London. Their place is now occupied by Maisky, Right Menshevik, who during the civil war was a minister of the White government in Kolchak’s territory. Troyanovsky, Soviet ambassador to Washington, treats the Trotskyists as counter-revolutionaries. He himself, during the first years of the October Revolution, was a member of the Central Committee of the Mensheviks and joined the Bolsheviks only after they began to distribute attractive posts. Before becoming ambassador, Sokolnikov was People’s Commissar of Finance. Who occupies that post today? Grinko, who in common with the White Guards struggled in the Committee of Welfare during 1917-18 against the Soviets. One of the best Soviet diplomatists was Joffe, first Ambassador to Germany, who was forced to suicide by the persecutions. Who replaced him in Berlin? First the repentant oppositionist Krestinski, then Khinchuk, former Menshevik, a participant in the counter-revolutionary Committee of Welfare, and finally Suritz, who also went through 1917 on the other side of the barricades. I could prolong this list indefinitely. These sweeping alterations in personnel, especially striking in the provinces, have profound social causes. What are they? It is time, my listeners, it is high time, to recognise, finally, that a new aristocracy has been formed in the Soviet Union. The October Revolution proceeded under the banner of equality. The bureaucracy is the embodiment of monstrous inequality. The Revolution destroyed the nobility. The bureaucracy creates a new gentry. The Revolution destroyed titles and decorations. The new aristocracy produces marshals and generals. The new aristocracy absorbs an enormous part of the national income. Its position before the people is deceitful and false. Its leaders are forced to hide the reality, to deceive the masses, to cloak themselves, calling black white. The whole policy of the new aristocracy is a frame-up. The new constitution is nothing but a frame-up. Fear of criticism is fear of the masses. The bureaucracy is afraid of the people. The lava of the revolution is not yet cold. The bureaucracy cannot crush the discontented and the critics by bloody repressions only because they demand a cutting down of privileges. That is why the false accusations against the opposition are not occasional acts but a system, which flows from the present situation of the ruling caste. Let us recall how the Thermidoreans of the French Revolution acted toward the Jacobins. The historian Aulard writes: “The enemies did not satisfy themselves with the assassination of Robespierre and his friends; they calumniated them, representing them in the eyes of France as royalists, as people who had sold out to foreign countries.” Stalin has invented nothing. He has simply replaced royalists with Fascists. When the Stalinists call us “traitors,” there is in that accusation not only hatred but also a certain sort of sincerity. They think that we betray the interests of the holy caste of generals and marshals, the only ones, capable of “constructing socialism,” but who, in fact, compromise the very idea of socialism. For our part, we consider the Stalinists as traitors to the interests of the Soviet masses and of the world proletariat. It is absurd to explain such a furious struggle by personal motives. It is a question not only of different programmes but also of different social interests, which clash in an increasingly hostile fashion. “And what is, your diagnosis?” – you will ask me – “What is your prognosis?” I said before: My speech is devoted only to the Moscow trials. The social diagnosis and prognosis form the content of my new book: The Revolution Betrayed: What Is the USSR and Where Is It Going? But in two words I will tell you what I think. The fundamental acquisitions of the October Revolution, the new forms of property which permit the development of the productive forces, are not yet destroyed, but they have already come into irreconcilable conflict with the political despotism. Socialism is impossible without the independent activity of the masses and the flourishing of the human personality. Stalinism tramples on both. An open revolutionary conflict between the people and the new despotism is inevitable. Stalin’s regime is doomed. Will the capitalist counter-revolution or workers’ democracy replace it? History has not yet decided this question. The decision depends also upon the activity of the world proletariat. If we admit for a moment that Fascism will triumph in Spain, and thereby also in France, the soviet country, surrounded by a Fascist ring, would be doomed to further degeneration, which must extend from the political superstructure to the economic foundations. In other words, the débacle of the European proletariat would probably signify the crushing of the Soviet Union. If on the contrary the toiling masses of Spain overcome Fascism, if the working class of France definitely chooses the path of its liberation, then the oppressed masses of the Soviet Union will straighten their backbones and raise their heads! Then will the last hour of Stalin’s despotism strike. But the triumph of Soviet democracy will not occur by itself. It depends also upon you. The masses need your help. The first aid is to tell them the truth. The question is: to aid the demoralised bureaucracy against the people, or the progressive forces of the people against the bureaucracy. The Moscow trials are a signal. Woe to them who do not heed! The Reichstag trial surely had a great importance. But it concerned only vile Fascism, that embodiment of all the vices of darkness and barbarism. The Moscow trials are perpetrated under the banner of socialism. We will not concede this banner to the masters of falsehood! If our generation happens to be too weak to establish socialism over the earth, we will hand the spotless banner down to our children. The struggle which is in the offing transcends by far the importance of individuals, factions, and parties. It is the struggle for the future of all mankind. It will be severe. It will be lengthy. Whoever seeks physical comfort and spiritual calm, let him step aside. In time of reaction it is more convenient to lean on the bureaucracy than on the truth. But all those for whom the word socialism is not a hollow sound but the content of their moral life – forward! Neither threats, nor persecutions, nor violations can stop us! Be it even over our bleaching bones, the truth will triumph! We will blaze the trail for it. It will conquer! Under all the severe blows of fate, I shall be happy, as in the best days of my youth! Because, my friends, the highest human happiness is not the exploitation of the present but the preparation of the future.